Topical tip: Practical notes on using off-axis oblique illumination for microscopy. Off-axis (anaxial) oblique is a popular contrast enhancement technique for the microscopy enthusiast as it can be both very effective and readily tried on most compound microscopes at little cost. Resources by Micscape contributors on both the off-axis and annular oblique technique are in the Micscape Library - Oblique. The textbooks often advise that care needs to be taken with off-axis oblique with the user making critical assessments of the image and also comparing the results with other techniques to ensure what is seen is genuine. This is with good reason as the technique for certain subjects may create artifacts or structures that are misleading or false. It is worth ensuring that for the off-axis oblique method used, both the extent and orientation of the oblique can be controlled to study subjects under varying conditions. Some methods for controlling these parameters are summarised below, with notes on ensuring reproducibility, followed by examples of false and real structures that can be seen. Note that only off-axis oblique is being discussed. Annular oblique (also called circular oblique (COL)) is primarily a uniform oblique illumination. See Micscape Library link above for contributors' articles on COL. The underlying theory for why oblique can offer both contrast enhancement and increased resolution cf brightfield is superbly described and illustrated in Molecular Expressions 'Introduction to oblique illumination'. 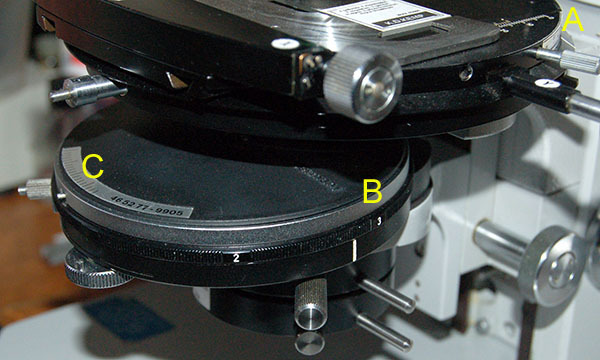 Angling the mirror or external light source off the optical axis (for microscopes with external lighting). For microscopes with built in lamp, off-setting the lamp filament has been suggested. The practicality may depend on how easy it is to recentre the lamp. For the author's Zeiss stand, where centring the 100W halogen lamp filament and its mirror image takes time and care, I don't find this very practical. This a more basic method with the least reproducible control, the methods below are arguably better. Inserting stops with variously shaped cut-outs into the condenser filter tray. These can be readily be made out of opaque card although some older scopes came supplied with a set of stops, which typically included rectangular, triangular and crescent shaped cut-outs. Variants of filter stops include for example the Mathias arrow (see Walter Dioni's article). 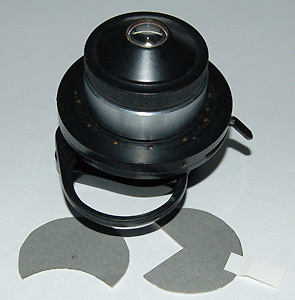 A typical Abbe condenser (a LOMO) with swing out filter tray with two examples of homemade stops. A paper tab can be added as shown on righthand stop. Extent: the size and shape of the cut-out but the swing-in filter tray may also offer some control, also experiment with condenser iris between open and stopped down somewhat. Orientation: the stop can be rotated in the filter tray mount by hand; a better method is to attach a small paper tab on the stop to allow it to be rotated. Alternatively if a rotating stage is used, the specimen can be rotated with respect to the stop. On a phase condenser, moving the brightfield port, darkfield / phase ring off-axis. Zeiss phase condenser, view of back focal plane of a 25x NA0.45 objective. L to R, just off-centre brightfield port, darkfield and phase '2' plate. For brightfield, the aperture iris partly controls effect, experiment with iris setting as also controls NA. Even slight oblique as shown for brightfield port, can often improve contrast considerably e.g. for diatoms. For the Zeiss condenser the orientation is fixed, see right. Extent: moving partially off-axis the large crescent of the brightfield port and controlling aperture iris setting. Or the phase rings of various sizes offer a variety of oblique shapes to try off-axis. Orientation: depending on the phase condenser design the orientation may be fixed. In which case it is important that the specimen can be rotated with respect to the condenser. This is the author's preferred method on a Zeiss stand using the phase condenser and rotating stage. Using a dedicated oblique condenser, e.g. the LOMO aplanatic oblique condenser, or the condenser often fitted as standard in earlier models by e.g. Zeiss or Leitz. The LOMO aplanatic oblique condenser. The knob controls the aperture offset and is graduated in mm either side of centre; the whole unit can be rotated as shown by arrows to change orientation of oblique with respect to specimen. Extent: The condenser iris was usually moved off-axis on a graduated slider and also offered rotation. Orientation: the condenser iris could be rotated round the optical axis. Unlike an enhancement technique like phase, where for a given objective the phase plate is aligned exactly, for the same objective many variations of the type (e.g. stop shape), extent and orientation of the oblique are possible. This is an advantage for creating the enhancement desired but also a potential disadvantage if trying to reproduce an exact setup at a later date or recording what was used to take a photomicrograph. Like many enthusiasts no doubt, I have printed blank forms for recording all the usual microscope and camera parameters when taking a photomicrograph. More recently I've extended it to record all the parameters of oblique used, particularly when studying some critical diatoms where the difference between oblique settings for resolution of punctae or not can be quite critical. The example below is for a phase condenser, the parameters would of course differ if say a dedicated oblique condenser was used. The Zeiss brightfield / phase / darkfield condenser which the author uses for off-axis oblique on a Zeiss stand. To quantify, and later reproduce if needed the oblique setting used, the following are measured. A - the angle of the stage to record the orientation of the oblique to the subject (on the author's example a homemade graduated scale). If studying a diatom strew slide at higher powers, the x / y controls of stage are also noted to record which diatom was studied. B - the brightfield / darkfield / phase ring used, and which direction it was offset. The extent of oblique, in this case the distance of the '3' phase ring from white bar 'click stop' for normal use, is measured with a thin strip of 1 mm gridded graph paper. C - if using an off-centre brightfield position, the iris aperture forms one edge of the oblique cut-out and affects NA used; the iris setting can be read off the graduated scale. Note added Dec. 15th 2008. H. Wessenberg and H. K. Reed in their paper "The use of oblique illumination in microscopic observations of living protozoa", Transactions of the American Microscopical Society, 1971, Vol. 90, No. 4, pp. 449-457, describe another way of using the Zeiss phase condenser for creating oblique by 'decentering' the 'first accessory lens' or lower swing out 'accessory lens'. Their images of protozoa are most impressive. With thanks to A. Selwyn St. Leger for pointing out this reference. This diatom frustule is a good subject for demonstrating the effect of oblique orientation on structure (as interpreted by the optical microscope). Zeiss 100X NA1.3 objective, blue-violet filter, Nikon D300 DSLR in monochrome. Oblique ca. 30% of full aperture with offset brightfield port in phase condenser. Images out of camera. Klaus Kemp '8 form test plate'. Arrows show direction of off-axis oblique. Above: With the oblique orientated along the diatom long axis, little evidence is seen of the peripheral structure of the frustule. In this lighting the shadowing suggests there are raised features along the central long axis. Punctae resolution is partial but taking on the appearance of false vertical striae. The striae are often more noticeable when the objective NA is only just sufficient to resolve the punctae. In this case it is well within the capabilities of the objective. Above: With the oblique orientated vertical to the diatom long axis, the peripheral structure is shown. The shadowing now makes the features along the long axis look recessed. 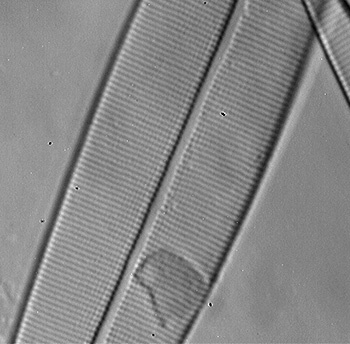 The punctae resolution is better but near the diatom axis they are taking on the appearance of false horizontal striae. Above: With the oblique orientated approximately 45� to the diatom long axis, the peripheral structure is shown and the punctae resolution is optimised without showing any false striae. It can be difficult deciding from the optical microscope's interpretation of the frustule detail what the real structure is. SEM imagery also shows that the internal and external detail of the frustule can be very different for a given diatom species. A classic test diatom, with punctae spacing ca. 0.25 �m, i.e. at or near the limit of the visible light microscope, and thus a popular challenge amongst microscopy enthusiasts since the 19th century. One of the best descriptions of using oblique for resolving punctae on this diatom is in Edmund Spitta's 'Microscopy', eg 2nd edition 1909. He discusses and illustrates in great detail how to use oblique to affect critical resolution in A. pellucida as well as explaining the underlying theory. His superb photomicrographs of resolved A. pellucida punctae and his other striking diatom images I still aspire to reproduce. Camera - Opticstar PL-130M 1.3 Mpixel USB monochrome. 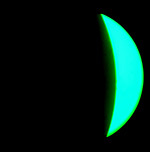 Oblique crescent ca. 25% of full aperture with offset brightfield port in phase condenser. Victorian unnamed strew of A. pellucida. Richmond Park, Sirax mount. In all three images below, the same diatom specimen was used. The oblique orientation was the same, from the left and almost horizontal. Single VGA images captured, out of camera except tonal balance improved and normalised between the three. Left: with diatom perpendicular to oblique, the frustule edges and central axis are shown clearly but contrast and detail of the punctae is poor. Middle: with diatom long axis parallel to oblique, the frustule detail is seen as parallel lines or 'striae'. 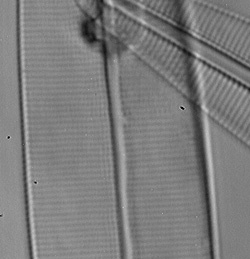 These are false structures of unresolved rows of punctae but is the accepted appearance of how the visible light microscope interprets the frustule detail for this alignment of oblique. Right: with diatom long axis approximately at 45� to the oblique, the striae take on a beaded appearance as evidence of individual punctae. In places there's evidence of full resolution. Spitta notes that this angle is about ideal for punctae resolution. The author's example isn't a very good one but gives a feel for the importance of oblique orientation. Assuming the optics are capable, achieving the most convincing full resolution can take patience with careful manipulation of the microscope. To see what A. pellucida really looks like, rather than the visible light microscope's interpretation of it; Gary Gaugler published a fascinating illustrated paper in the May 2007 issue of Microscopy Today, An SEM analysis of Amphipleura pellucida with new findings. Also available as a downloadable pdf from the Microscopy-UK website, hosted with the kind permission of Gary Gaugler and Microscopy Today Editor, Ron Anderson. 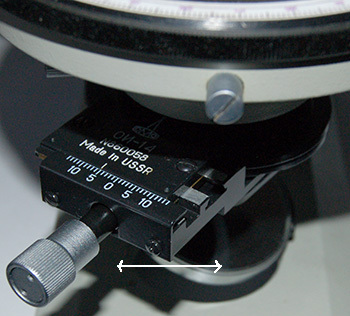 The A. pellucida example illustrates the benefit of rigorous recording of the oblique setup (using the author's Zeiss stand with phase condenser as an example). It's probably not critical for many subjects, but for fellow enthusiasts who enjoy the fun (and frustration!) of studying subjects such as Amphipleura pellucida, the slightest change of setup can be critical for optimal resolution. I have a single frame on a roll of monochrome film of my best image to date of A. pellucida punctae crisply resolved with a Zeiss 100/1.3 Neofluar with oblique using modest optics in blue light. Unfortunately I risked using out of date film developer and a very thin negative resulted. I've yet to recreate a comparable image as I didn't record exactly how I'd setup the oblique or which diatom on a strew was imaged. Footnote: Interference filters are readily available and good value from some eBay suppliers, with thanks to Hugo Johnson for telling the author of this source prompted by my Interference filter article. Published in the December 2008 edition of Micscape.